On Saturday March 24 at approximately 11:15 pm the Levy County Sheriff’s Office and the Levy County Department of Public Safety (DPS), along with multiple fire units responded to 11830 NE 81 Terrace to multiple 911 calls about a structure fire. 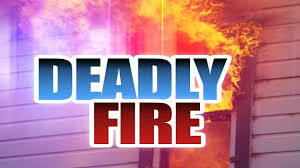 Fire and law enforcement officials arrived to find a single wide mobile home fully engulfed in flames. Witnesses on scene told responding units that there was still a person inside the home. This person, identified as 79 year old Bronson resident Felix Shackelford, was unable to escape and did succumb to the fire. Witness reported Shackelford had been working on a propane space heater earlier in the day and when he lit it, it exploded. Shackelford attempted to extinguish the flames and was trapped inside the home. His wife, Margaret, was able to escape. Their son, Author Carroza, had been working on a vehicle in the yard and had taken the vehicle on a test run when the fire started. He attempted to gain entry into the home after the fire started, but was not able to locate his father inside due to the extreme heat. The Florida State Fire Marshal responded to assist in the investigation with the LCSO. The fire has been deemed accidental. The Red Cross has been contacted and is assisting the family. Drugs are Dangerous - In more ways than one. Honestly folks, we don’t make these stories up for the fun of it. Truth can be, and usually is, stranger than fiction. LCSO deputies responded to a robbery report last night at 11:50 pm in the University Oaks Subdivision east of Bronson. The victim, a 17 year old, reported he was jumped by unknown assailants and robbed of approximately one ounce of marijuana. Here is how his story unfolded. The 17 year old was contacted by a mutual friend through Snap Chat. 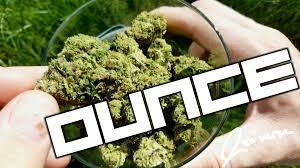 This mutual friend was bartering a deal to sell 7 grams of marijuana for a third party friend. The deal was supposed to happen on the side of the road near the 17 year old’s home. Our enterprising 17 year old told his buddy he had an ounce and “if” this guy wanted to pay for it, he could buy the whole amount. Our young, street level pharmaceutical representative snuck from his room while under the watchful eye of his father and was on his way to being rich. This is when he ran a-foul of two hoodie clad robbers. These unidentified thugs beat up our would-be-seller and took his whole ounce of ill-gotten herbal goodness, leaving him with a black eye and a bruised ego. To answer your question, yes, this is a robbery. And, yes, we would have arrested the people responsible if found. We truly believe the fruit of the crime has gone up in smoke, but if it hasn’t the robbers would also be charged with possession of marijuana. As for our young victim, he too could be charged with dealing in drugs. This investigation is on-going and anyone with information that could help us restore his street cred, we would be forever in your debt. Tips can be given directly to our Drug Task Force Investigators by calling 352-486-5111 or those who to wish remain anonymous can call Crimestoppers at 1-877-349-8477. Missing Child Todd Watson has been located. Todd Watson, the 2 year old toddler who wandered from his home earlier today in Rosewood has been located. Law enforcement from the Levy County Sheriff's Office, the Florida Department of Corrections Cross City K-9, the Citrus County Sheriff's Office Aviation Unit, Marion County Air 1, Taylor County CI and the approximately 200 volunteers searched the wooded area near the child's home located at 9730 SW 67 Street in Rosewood. Todd was found safe and is currently being evaluated by EMS. The LCSO and Sheriff McCallum want to offer our sincere thanks to all of the volunteers who offered their time and extraordinary efforts and neighboring agencies who helped to make this a successful community effort. 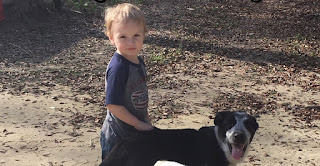 Todd Watson, the missing toddler from Rosewood, Florida is still missing. Todd was followed by his beloved dog (pictured). Anyone having current information that would assist us in finding Todd is urged to contact the Levy County Sheriff's Office at 352-486-5111 or call 911. There are currently several law enforcement agencies on scene and the are actively searching. Volunteers are asked to check in with law enforcement on scene. Please do not start searching on your own. Your efforts could impede current law enforcement search efforts. Levy County Deputies are currently in the area of 9730 SW 67 Street in Rosewood attempting to locate a missing 2 year old child. The mother called 911 shortly after 12:30 when she could not locate the toddler. The child wandered away from the home while the mother was doing chores. The missing child is Todd Watson. 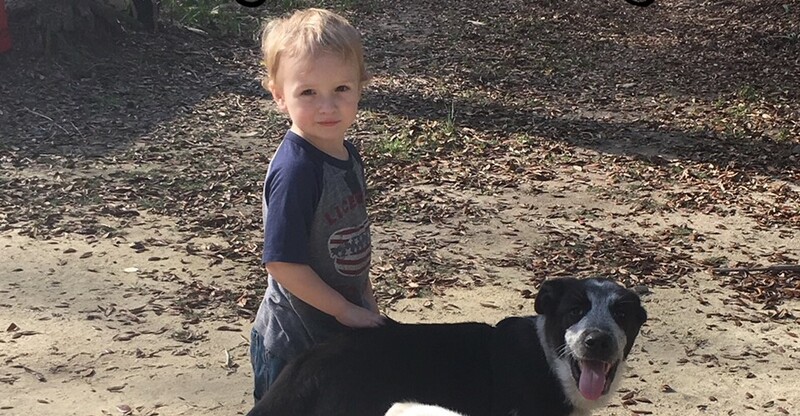 He is 2 years old and was last seen wearing jean shorts and a red tank top with black trim. He was not wearing shoes. He is approximately 2’5” tall and weighs 24 pounds. Todd has blonde hair and has blue eyes. The LCSO has our K-9 and other deputies in the area searching. Sheriff McCallum has requested the assistance of the Citrus County Sheriff’s Office Aviation Unit to help with this search. The CCSO Air One is currently in the area searching. The LCSO has also requested the assistance of the Cross City Department of Corrections Blood Hound K-9 Team and they are on the way. Any person who has information which could help us locate Todd is asked to immediately call 352-486-5111. On March 11, 2018 at approximately 1:40 pm Deputies responded to a citizen compliant approximately 2 miles south of Otter Creek. A 911 caller told dispatchers they were on the side of US 19 with a woman and her 10 year old child and help was needed. The caller told dispatchers the woman was seen attempting to push the child into oncoming traffic several times. Deputies arrived and spoke to Cherissa Latryce Drew (2-8-71) of Orlando. Mrs. Drew spun a very strange story while speaking to deputies. She initially told deputies she was kicked out of her vehicle by her husband after arguing with him. She said the husband took her and their child from their home in Orlando, ordered her to leave all of their electronic devices behind and threatened to kill her and flee with the child. She also told deputies her husband had murdered her mother in Orlando before they left. While our deputies were speaking to Mrs. Drew, she partially disrobed and attempted to flag down other passing motorist. Deputies attempted to control her actions and she immediately appeared to faint then began complaining of chest pains. EMS arrived and began treating her inside of the ambulance. Shortly after entering the ambulance a paramedic quickly summoned deputies and told them Mrs. Drew was suffocating the child. Deputies entered the ambulance and saw Mrs. Drew clutching the flailing child, holding her tightly around the neck and against her chest. Deputies saw Mrs. Drew had covered the child’s face with a shirt. Deputies wrestled the child from Mrs. Drew grasp. Mrs. Drew resisted violently as our deputies attempted free the child from her and arrest her. Mrs. Drew was arrested and transported to the Levy County Detention Facility. 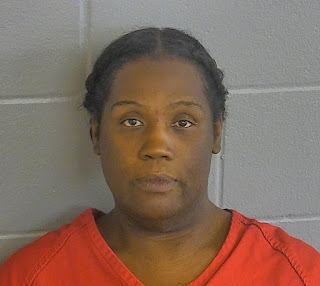 She has been charged with battery on a law enforcement officer, attempted murder, child abuse, neglect of a child, indecent exposure in public and resisting arrest. Her bond has been set at $386,000.00. Based upon Mrs. Drew’s claim of a domestic disturbance and her statement the husband had committed a murder, deputies continued to scour the area for hours looking for Mr. Drew. Investigators with the LCSO Criminal Investigations Division also contacted the Orange County Sheriff’s Office to relay the information obtained. Orange County S. O. initiated an investigation in order to locate the mother who was reported to have been killed and attempt to locate Mr. Drew. The mother was found safe at her home in Orlando. Thus far, Mr. Drew has not been located. Anyone with information that could aid this investigation is asked to contact Investigator Mike McNeil at 352-486-5111 extension 266. Bronson, Fla – The Florida Department of Health in Levy County today issued a mosquito-borne illness alert for Levy County. A case of Eastern Equine Encephalitis has been confirmed in a flock of Emus in the Bronson area and there is a heightened concern residents could become ill. DRAIN standing water to stop mosquitoes from multiplying. · Drain water from garbage cans, house gutters, buckets, pool covers, coolers, toys, flower pots or any other containers where sprinkler or rain water has collected. · Discard old tires, drums, bottles, cans, pots and pans, broken appliances and other items that aren't being used. · Protect boats and vehicles from rain with tarps that don’t accumulate water. · Maintain swimming pools in good condition and appropriately chlorinated. Empty plastic swimming pools when not in use. COVER skin with clothing or repellent. Clothing - Wear shoes, socks, and long pants and long-sleeves. This type of protection may be necessary for people who must work in areas where mosquitoes are present. Repellent - Apply mosquito repellent to bare skin and clothing. Always use repellents according to the label. Repellents with DEET, picaridin, oil of lemon eucalyptus, para-menthane-diol, and IR3535 are effective. Products with concentrations of up to 30 percent DEET (N, N-diethyl-m-toluamide) are generally recommended. Other U.S. Environmental Protection Agency-approved repellents contain picaridin, oil of lemon eucalyptus, para-menthane-diol, or IR3535. These products are generally available at local pharmacies. Look for active ingredients to be listed on the product label. In protecting children, read label instructions to be sure the repellent is age-appropriate. According to the Centers for Disease Control and Prevention (CDC), mosquito repellents containing oil of lemon eucalyptus should not be used on children under the age of three years. DEET is not recommended on children younger than two months old. COVER doors and windows with screens to keep mosquitoes out of your house. Repair broken screening on windows, doors, porches, and patios. For more information on what repellent is right for you, consider using the Environmental Protection Agency’s search tool to help you choose skin-applied repellent products: http://cfpub.epa.gov/oppref/insect/#searchform. The Department continues to conduct statewide surveillance for mosquito-borne illnesses, including West Nile virus infections, Eastern equine encephalitis, St. Louis encephalitis, malaria, chikungunya, and dengue. Residents of Florida are encouraged to report dead birds via the Florida Fish and Wildlife Conservation Commission’s site - http://legacy.myfwc.com/bird/default.asp. For more information, visit DOH’s website at http://www.floridahealth.gov/%5C/diseases-and-conditions/mosquito-borne-diseases/index.html or call your local county health department.